Dave Anderson is senior directorautomotive market and long products program for Steel Market Development Institute, Washington, D.C.; tel. 202/452-7100, www.smdisteel.org. Advanced grades of steel, including advanced high-strength steel (AHSS) and ultra-high-strength steel (UHSS) with tensile strengths of greater than 1000 MPa (1 GPa) have been adopted rapidly in the automotive industry to meet stringent fuel economy targets, enhance occupant protection and improve vehicle performance. AHSS provides optimal performance due to its excellent strength and ductility. Fig. 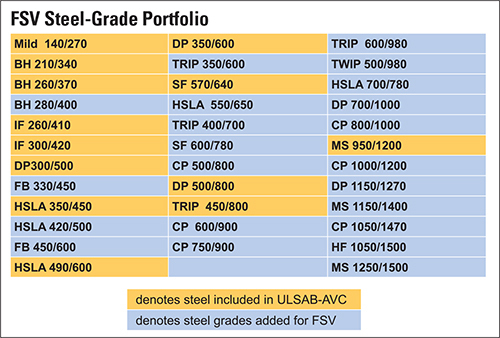 1—AHSS-grade portfolio available for WorldAutoSteel FutureSteelVehicle (FSV) project in 2011. Many grades featured tensile strengths in excess of 900 MPa. However, from the perspective of stamping-die performance, these AHSS prove challenging when paired with traditional die materials and surface-treatment technologies. This can lead to significant cost increases resulting from frequent die maintenance and interruptions in the manufacturing process. To assist metalformers, the Auto/ Steel Partnership’s (A/SP) Stamping Tooling Optimization (STO) team has been studying the effects of AHSS and UHSS on tooling design and maintenance. The results of their work have been implemented in each of the member auto companies’ (FCA USA LLC, General Motors and Ford) die-design standards upon completion of different phases of the project. Fig. 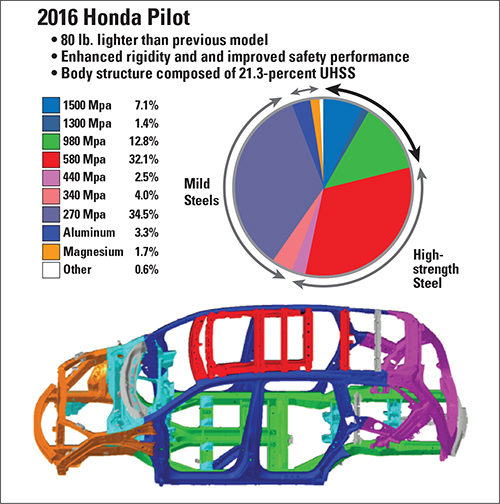 2—The 2016 Honda Pilot featured a tailor-welded, hot-stamped 1500 MPa-tensile-strength door ring. The international steel industry has completed several collaborative projects beginning with the UltraLight Steel Auto Body (ULSAB) project in 1998 and continuing through the WorldAutoSteel FutureSteelVehicle (FSV) project in 2011. Each of these projects achieved significant weight savings and associated fuel-efficiency improvements with the introduction of new generations of AHSS and innovative manufacturing technologies. In fact, the FSV program nearly doubled the AHSS portfolio (Fig. 1) and innovative manufacturing technologies available to the automotive design and manufacturing engineers. The North American automotive community has embraced the results of the FSV program as evidenced by the rapid adoption of many of the AHSS grades and innovative manufacturing technologies introduced within their program. Figs. 2 and 3 highlight some of the material/manufacturing innovations in current model vehicles produced in North America. Fig. 3—The 2015 Chevrolet Colorado/GMC Canyon included a tailor-rolled (variable-thickness), hot-stamped 1500 MPa-tensile strength B-pillar. These real-world examples emphasize the importance of being able to process AHSS grades featuring tensile strengths greater than 1GPa. As these grades grow in acceptance, the A/SP Stamping and Stamping Tooling Optimization teams are developing enabling technologies for using these grades within the existing automotive-manufacturing infrastructure. Recently, the A/SP STO team completed a real-world production test on DP1180 steel. 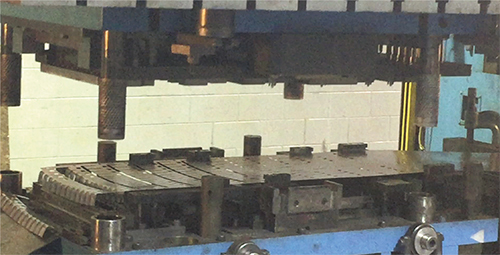 The study’s goal: Evaluate die durability during a flanging operation of bare DP1180 steel, and update automotive-tooling standards accordingly. Fig. 4—The two-phase study was conducted on a progressive die operated at Richard Tool & Die Corp., New Hudson, MI, under production conditions. The 14-station die was designed to produce an experimental part (as this schematic shows) with 12 flanges of complex shape. The two-phase study centered on a progressive die operated at Richard Tool & Die Corp., New Hudson, MI, under production conditions. The 14-station die produced an experimental part (Fig. 4) with 12 flanges of complex shape. The selected stamping material, bare 1.2-mm-thick DP1180 sheet, represented the most severe material challenge available today for cold-stamping applications. Fig. 5 shows the 14 progressive-die operations on the strip layout with Fig. 6 showing the die in the press during the stamping operation. The experimental test die consisted of 31 inserts, using a combination of one of 11 die materials and one of nine surface treatments (coatings). Phase 1 of the study was conducted in 2015 using 18 die material and coating combinations currently specified for the production of AHSS parts with tensile strengths below 980 MPa (see Table 1). Phase 2 in 2016 was conducted on part material with tensile strengths greater than 980 MPa using 13 die material and coating combinations based on the results from Phase 1 (see Table 2). Die materials tested included TD2, D2, T44, CC1, D6510, DC53, S2333, S0050A, SLD-I, Toolox 44 and Cast Caldie. Coatings tested included PVD Duplex CrN, Duplex CrN and Most, CR Plate, Cool Sheet, Concept, Concept and Most, Cr Plate, Cr Plate over ion nitride, and Duplex Variantic (TiAlCN). Fig. 5—The 14 progressive-die operations used to produce an experimental part are shown on this strip layout. Prior to running the experiments, computer simulation via LS-Dyna and AutoForm ensured no formability issues with the designed setup. The study judged die wear based on the following criteria: safe (no damage), minor scratch marks and very rough scratch marks on the stamped part surface (Fig. 7). Every 100 hits yielded panels for evaluation. Employing die and coating materials successfully used for steels with tensile strengths less than 980 MPa, the 2015 experimental trials resulted in performance failures as early as 35 hits, and most of the inserts failed by 20,000 hits. The only combination to survive through 20,000 hits: TD2 coated with Cool Sheet (highlighted in Table 1). Fig. 6—The progressive die, experimental tools and strip are shown in operation at Richard Tool & Die. In 2016, the team investigated die durability of a new set of die material and coating combinations to determine applicability to forming the next generation of AHSS with tensile strengths greater than 980 MPa. In general, die-insert performance proved significantly better than in 2015. Though the study noted one failure after 4000 hits, the majority of inserts lasted more than 10,000 hits with four combinations enduring 65,800 hits. In fact, the die insert (TD2 coated with Cool Sheet) that performed best in the 2015 experiments continued to perform without major failure in the 2016 experiment, with a combined hit total of more than 80,000. Fig. 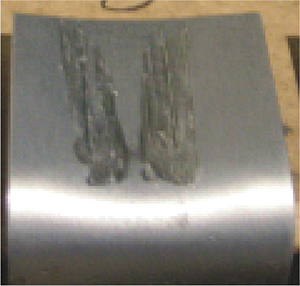 7—This experimental part shows rough scratches, caused by a worn tool. The team further analyzed the experimental results of both phases to evaluate a connection between die wear and insert hardness or roughness. The analysis proved no clear direct correlation with the rankings of the wear results. However, previous studies demonstrated that inserts with hardness greater than 60 Rockwell C tended to chip more readily while hardness less than 54 Rockwell C led to premature wear. The results of insert surface roughness were even more scattered than hardness, but also showed a possibility of a mid-range roughness as giving the best wear results. This process was repeated with the Phase 2 results. As with Phase 1, the team found no clear direct correlation between the die performance and those measures. As part of the Phase 2 experimental analysis, the team measured as-received steel and final part-surface roughness. As the die wore, the roughness of the final part differed depending on the flange material and coating. In some cases, roughness increased as was expected. But in other cases surface roughness decreased, indicating that the tool actually wore down the peaks of the part surface during the flanging operation. Additionally, the study team examined each worn die insert in a scanning electron microscope with the wear area measured using imaging-processing software. These results correlated with the part-surface evaluation, confirming the supposition that current high-volume die-coating materials cannot withstand the stamping of the DP 1180 and contributed to early tool failure and heavy scratches in the stamped part. Recent studies by The A/SP Tooling Optimization team concluded that improved die material and coating combinations are needed to form steels with tensile strengths greater than 1 GPa. Several die material and coating combinations proved more effective for wear resistance in the flanging operation over previous die designs used to stamp steel with strengths less than 1 GPa.